The Conflict Resolution Day Alberta Planning Group invites individuals and organizations involved in Alternative Dispute Resolution (ADR) to celebrate Conflict Resolution Day by organizing an event for your organization, your clients, your community, your city, or your region. An event can be large or small, private or public; anything that gets people talking about the options and benefits that ADR can offer. Offer training: Use our presentation package to offer a fun, practical one-hour workshop that gives participants a communication tool they can immediately put to use. Host an activity: do it yourself or partner with other practitioners or organizations in your community. Looking for ideas to spark your imagination? Check out our list of Conflict Resolution Day Activity Ideas or check out past events held in our province. Identify your audience, choose a time, and book a venue. If you are interested in facilitating this year’s workshop in your area, join us for a Train-the-Trainer session on the 3rd Thursday of September every year from 1:30-3:30pm in Edmonton (virtual dial-in available). Please contact Tara at sccm@strathcona.ca to register (registration is mandatory). Let the media in your area know what you are doing to celebrate Conflict Resolution Day. Personalize our sample media release, then find your local media outlets and email your release to their newsrooms. Make sure to send out one media release a few weeks in advance, and another closer to the date. 3. Tell us what you have planned! Send us your event details and we will add them to our Events page. 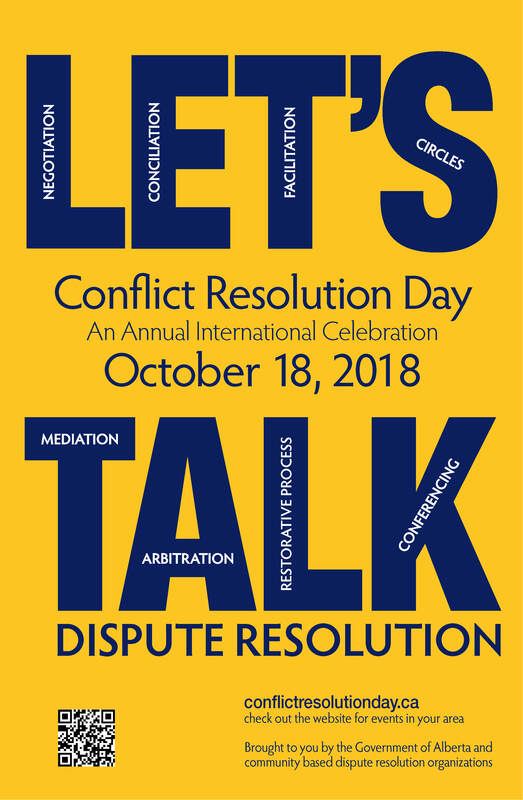 Fill out the online form on the page or send us an email at info@conflictresolutionday.ca. Print or share our poster - use the pdf version as is, or use the .docx version and add your event details to the space at the bottom.